Those of you, who have read my review on Six of Crows, already know that I absolutely loved it! I thought it was a brilliant and captivating read, with amazing characters, a fascinating plot and the perfect blend of fantasy, action, humour and romance. Leigh Bardugo’s writing was flawless and I couldn’t help but write down several lines and dialogues I came across in the book while reading it that were just too good to ignore. I was initially going to include those quotes in my review, but they turned out to be a lot more than I expected and I decided to make a separate post about them. So here they are! “Kaz Brekker didn’t need a reason. Those were the words whispered on the streets of Ketterdam, in the taverns and coffehouses, in the dark and bleeding alleys of the pleasure district known as the Barrel. The boy they called Dirtyhands didn’t need a reason any more than he needed permission – to break a leg, sever an alliance, or change a man’s fortunes with the turn of a card. First of all, let me start by saying that I have no words for this book! No, actually that’s a lie. I have so many words for it that I don’t even know where to begin. But I guess I can just start with the first word that comes into mind which in my opinion describes it perfectly. Mind blowing! That’s what it was. I finished Six of Crows three days ago and I still can’t get over how brilliant this book was! I haven’t read the Grisha trilogy yet so I had no idea what to expect when I started reading this but I wasn’t dissapointed in the least. In fact, like Kaz would probably say, I think this book was a really good investment. It was fast paced, with a fascinating plot and intiguing storyline, amazingly well developed characters and excellent world building and once I got into it for good I literally couldn’t put it down! The refreshing diversity among the characters who were all from different backgrounds and places, the carefully planned and perfectly executed twists and the undeniably faultless climax towards the end of the book made for an exciting and effortless read that in my opinion deserves to be called a masterpiece. And no, I’m not exaggerating. Leigh Bardugo’s writing was flawless, brilliant and undoubtedly captivating. I still can’t believe how fast I read this book once I was into the story for good. I remember reading chapter nine and then suddenly realizing I was in chapter twenty two and having no idea how I had gotten there so quickly. It’s time for my October wrap up. I have no idea why I haven’t done a wrap up here before, considering I already have this blog for about three months, but better late than never. Right? This book! It literally blew my mind! It had me sitting on the edge of my seat and writhing over the pages the entire time I was reading it! 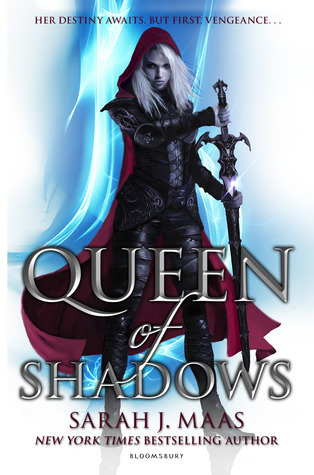 But I’m not gonna talk about this book right now because if I start I’ll never stop and this blog post is going to turn into a Queen of Shadow take over which is not what I have intended for today. But I am currently working on a review so hopefully it will up soon! I was supposed to write the review earlier but unfortunately couldn’t do it due to my lack of time in October and writer’s block so it’s gonna happen this month! So keep an eye out for it. And of course I gave this book 5 stars! Anything less would be unacceptable! So I woke up today with this very annoying feeling that I was forgetting about something. And I just couldn’t, for the life of me, figure out what that something was. Until I decided to log onto my Instagram and sure enough, that something I was forgetting about was right in front of me. I’m talking about NaNoWriMo of course. Luckily it didn’t take me too long to remember because I really wanted to participate this year. I’ve never done it before but I figured it would be a good motivation for me to write more, so I decided to go for it. I already have my characters and setting and a vague idea of the plot so hopefully I will start doing the actual writing soon. For those of you who don’t know, I love to write! I love creating worlds and characters and places, I love coming up with new ideas for my stories and above all I love putting those ideas into words on my notebooks or my computer screen! I started writing when I was around twelve because, after reading novels like Harry Potter and The Chronicles of Narnia I had so many ideas in my head and I felt it would be such a waste to let them go. I still have so many notebooks lying around the house, filled with stories and ideas from those early writing days. Even though I’m proud of those early stories, I’d like to believe that my writing has improved dramatically so far. I try to write mainly in English, which can be very hard sometimes since my native language is Greek, but I do my best. One thing you should know about me is that I’m a huge lover of fantasy. It’s my favorite genre and the one I usually write. I’ve tried mystery and horror as well, but I’ve noticed that fantasy always works better for me. There are many fantasy sub genres but I think the one I prefer is epic or high fantasy because I’ve always been fascinated by the idea of being able to create an entire world on my own. And sure enough I have. More than one actually. I also love to plan! Meaning that I usually have to write down all the important details of a world or a story or the characters in it before I actually start writing that story. And because I love to draw, those details usually involve a map of that world as well.